Brittany is located in the North West corner of France. It is a region steeped in history and ancient Basque culture, making the perfect holiday for both families and couples. Brittany’s coasts attract the greatest number of visitors and have attracted a lot of second-home owners from France, and from Britain. The north and west coasts are rugged and rocky, with beautiful sandy coves and beaches. The range of hikes and walks along the coast is astounding and the ruggedness of the area makes it great for climbing and mountain biking. The south coast, facing onto the Bay of Biscay, is flatter, much milder, and graced by a number of large sandy beaches. These beaches make for a great family holiday, even if the water is a little colder than in the south of France. 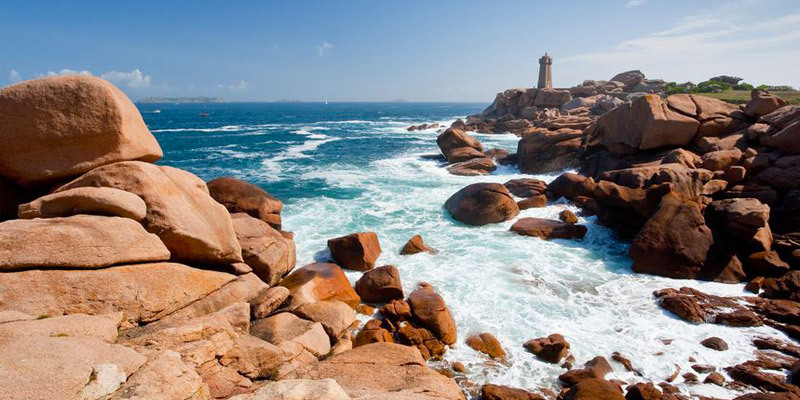 The Pink Granite Coast, named after the colour of its rocks, is one of the most beautiful stretches of Brittany’s coastline. The area is famous for its unusual rock formations, the best of which can be found on the coastal path between Perros-Guirec and the port of Ploumanac’h. Perros-Guirec is one of Brittany’s most popular resorts with families, primarily because of its sandy beaches, kids clubs and water sports. It is extremely popular in summer with Parisians coming out to Brittany during the school holidays. A must see is the World Heritage Site Baie du Mont St-Michel in Brittany. Perched on a rocky between Normandy and Brittany, this Gothic-style Benedictine abbey graces the horizon with a domineering yet sensual architectural silhouette.